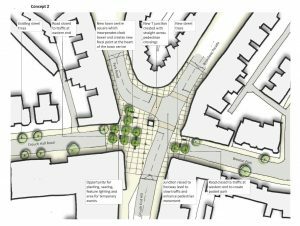 With new cycle routes, better road crossings, redirected main roads, and even a proposed new public square in the centre of town, TfL’s ‘Liveable Neighbourhoods Initiative’ is a big deal for Crouch End. 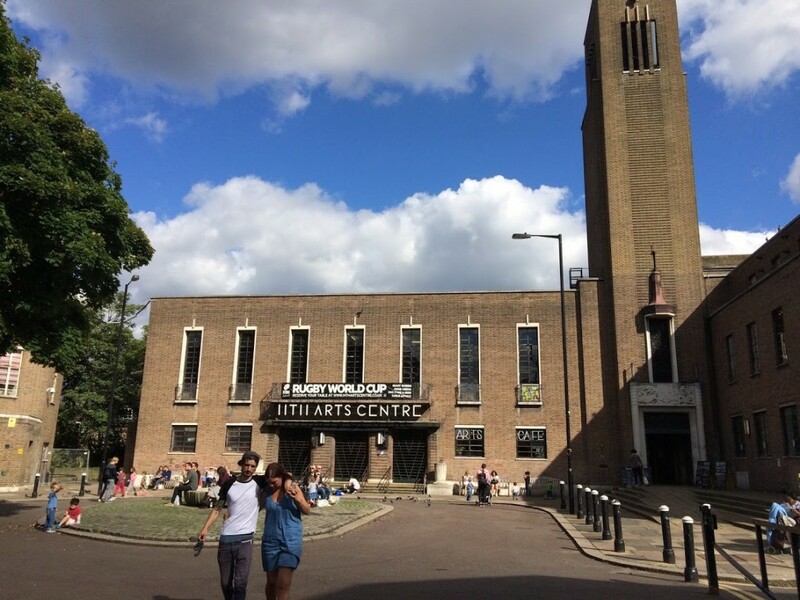 To read Part 1, an introduction to Haringey’s bid, click here. In this section we take a run through the interventions the Council’s regeneration planners may have in mind. There are of course details and issues not included in this discussion, for example much of the work will take place in a Conservation Area – and the Clock Tower is a listed building. We would support the drafting of a detailed design code for the public realm at the earliest opportunity. Haringey’s bid document to TfL is an outline presentation delivering the vision required by TfL, it does not feature fully worked up proposals. Nevertheless we thought such ideas it did contain should be discussed and more widely available. Whether things proceed exactly as set out at this early stage is open to question. NB. While the town centre interventions are the most eye catching, the overall package includes proposals for the wider area and the residential streets. To repeat, nothing decided here, but we can hazard a few guesses. The Broadway, Tottenham Lane and Crouch End Hill are in the crosshairs. The congestion on Tottenham Lane has been a subject raised repeatedly by the community. When parking is allowed on both side of the roads (at weekends particularly) the road often becomes impassable (see drawings below). 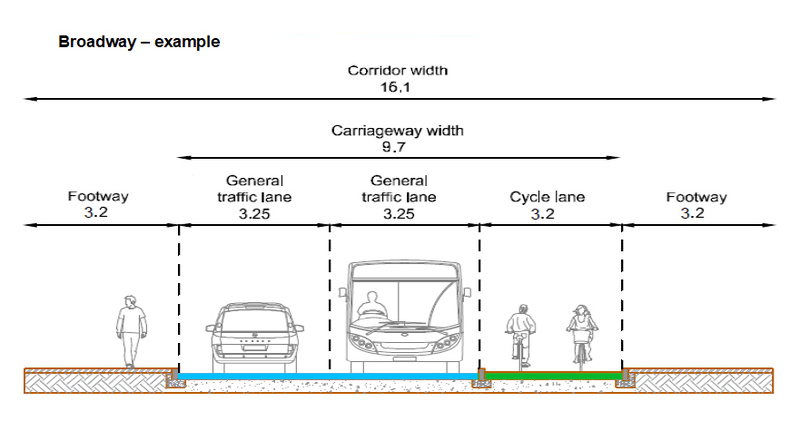 Proposals would seek therefore to provide adequate carriageway widths whilst introducing raised parking bays and significantly widening footways. This provides opportunities for greenery and pavement cafés and the traffic would be calmed sufficiently to allow cycle use. Bus bays would be preserved. Clearly the benefits are to pedestrians and the public realm, benefits which may improve footfall for local businesses, with wider pavements and shorter road crossings improving the visitor experience. The disbenefits probably centre on increased congestion, and there’s a question mark over what will happen to through traffic. Any impact on bus services must be closely assessed. Local air pollution is also worthy of assessment. If everyone started cycling the air would improve, but we have to be honest and say that if congestion increases then there is a chance that roadside air quality levels will worsen. I guess the hope is for improvements in the longer term. 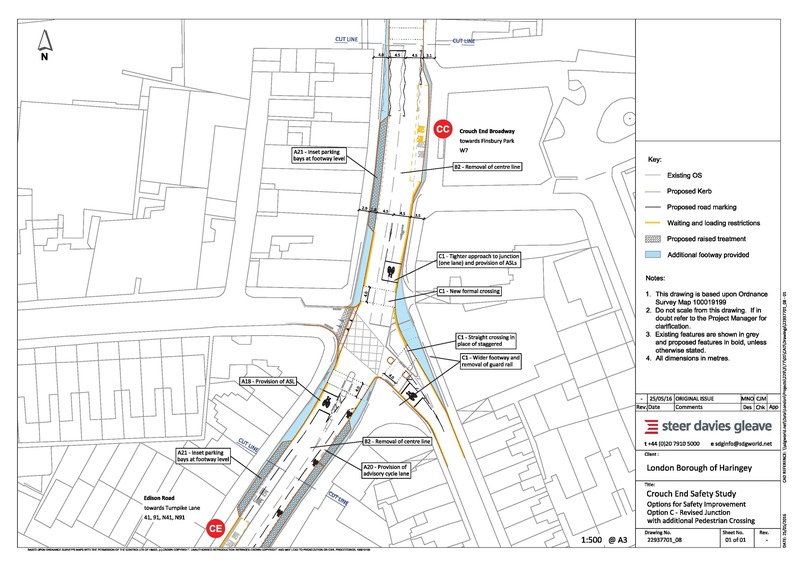 We don’t know where a new cycle route would go, and within the town centre cycle lanes may eventually be restricted to The Broadway or Crouch End Hill (ie. 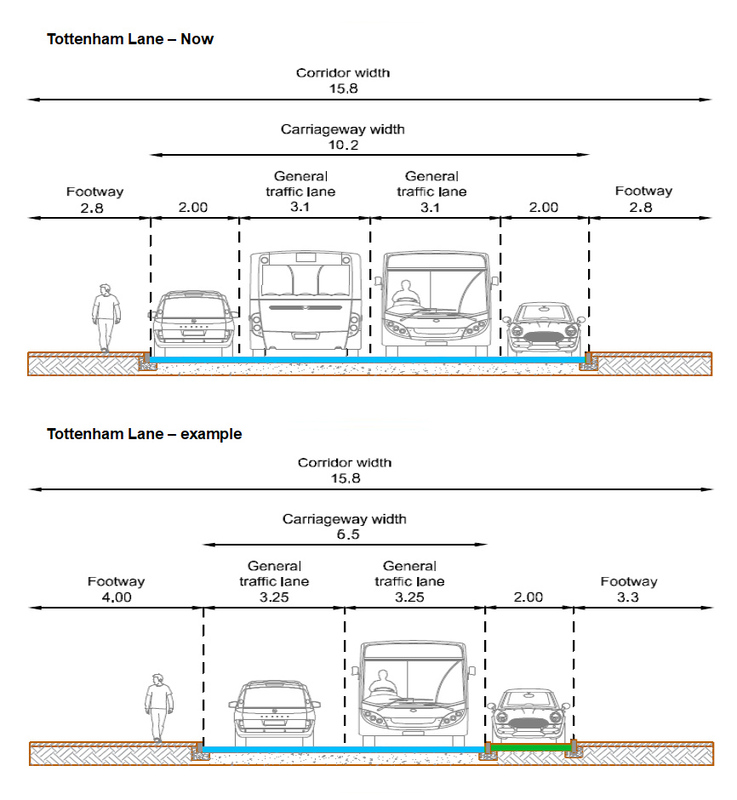 not Tottenham Lane) – the cross section image below for a two-way cycle lane on the Broadway is entirely speculative, but illustrates possibilities. In general it is difficult to see how pavements can be much wider, traffic still flow, and cycle lanes be introduced. Something has to give. So far people seem happy to prioritise the footways, and help the cyclists through traffic calming. Cyclists make up around 3-6% of vehicle movements in the town centre, however per capita this represents only 1.8% of journeys taken – you’d have to increase this number by a 1000% to have a noticeable effect on traffic! For every cyclist there are 15 pedestrians. Beyond the town centre the creation of segregated cycle lanes is easier, and the project contains a number of suggestions with interventions on residential streets, cycle priorities, and junction improvements. Another route, the “Quiet Way 10” is already being created, and runs down Uplands Road (yes, a steep hill) finding its way from Finsbury Park to Bounds Green. Firstly, this is a theme that people have already spoken to us about – particularly in relation to congestion on Tottenham Lane. There are currently 31 parking spaces in the primary shopping area, and most of these will probably be lost. It is possible to introduce raised on-pavement parking spaces, which are the preferred solution. Along a section of Tottenham Lane perhaps? This is the key move in terms of improving the public realm and we would suggest that in the shopping area the value of wide pavements outweighs the advantage of cycle lanes. 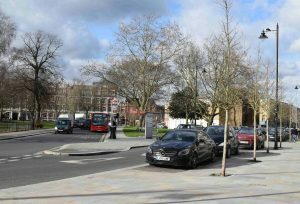 There are possibilities for pavement trading / street cafés on the new Square, along Tottenham Lane and at the entrance to Weston Park. It is crucial that we are able to present a case to local businesses that identifies clear advantages for them, including a rise in footfall, despite the loss of parking spaces – the widening of footways is an essential component of the presentation. 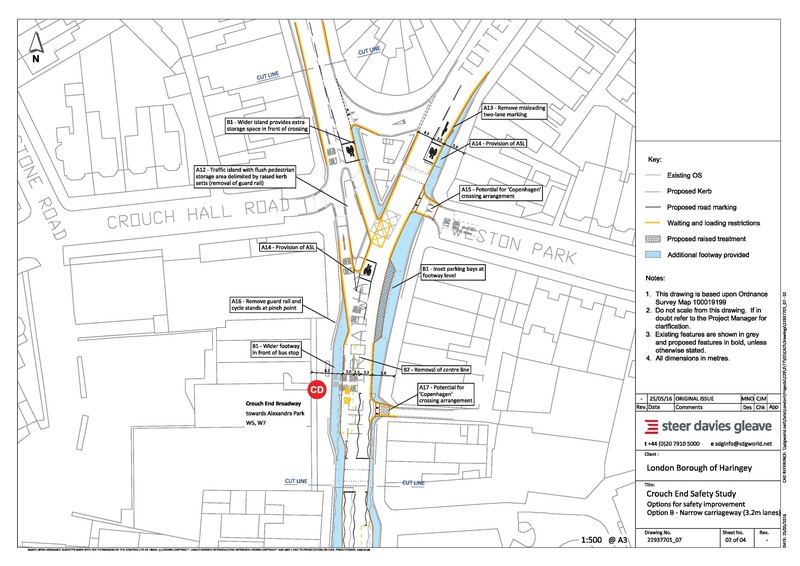 The possibility of closing the already restricted entrances to Crouch Hall Road and Weston Park is contained in the bid. ‘Modal filters’ would be introduced which allow cyclists to pass through. This would create new public spaces, suitable for pavement cafés, greening, and public art. Rat runs and servicing clearly require careful consideration. Obviously the headline grabbing proposal. Concept 1 appears to resemble the Arc de Triomphe. 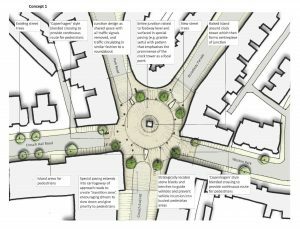 This would be on the shared surface model (go see Seven Dials), with the roads calmed and everyone jostling for position. With hundreds of vehicles per hour and more than thousand pedestrians, it would be an interesting experiment. I’m not sure we’d all survive – but I’m interested if people view it positively. 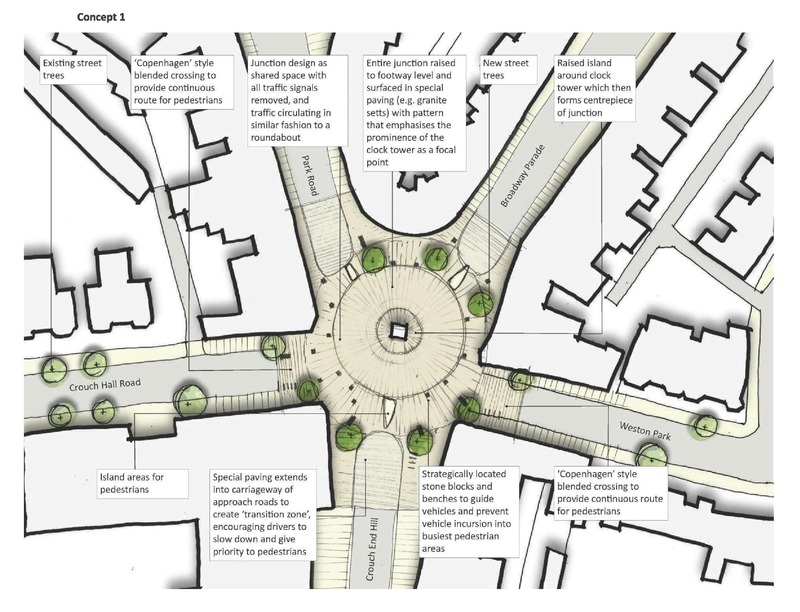 Concept 2 is the favoured choice of creating a new T-junction for road traffic and using the surplus road space to create a new Clock Tower Square. This follows the logic of recent high profile schemes, beginning with Trafalgar Square, with more recent local examples at Archway and Highbury Corner – ie. one side of a gyratory system is closed off forming a new paved space. As can be seen in the image below this is possible, there is the physical space, and the swept paths of buses and larger vehicles making the turn can be accommodated. Bus routes are unaffected. The arrangement is a huge improvement for pedestrians, with only one road to cross instead of the current three. The new Square offers more trees, more room, more places to sit. Somewhere to dump Chinese hire bikes, or sit and drink all day. The drawback is once again the likely reduction in the capacity of the roads and resulting congestion – this is because the junction currently has just two phases for road traffic, with the pedestrian crossings complying with the sequence (which is why it’s so lousy for pedestrians now), whereas the new arrangement would have three phases, ie. an extra one for a pedestrian crossing-only phase. Perhaps technology allows the ‘green time’ for the road users to be optimised however (and they do this near Highgate tube on the A1 don’t they?). If a bit of extra congestion is unavoidable, the question is, is it justifiable? Well, this is surely the point of the exercise – to prioritise pedestrians over cars. 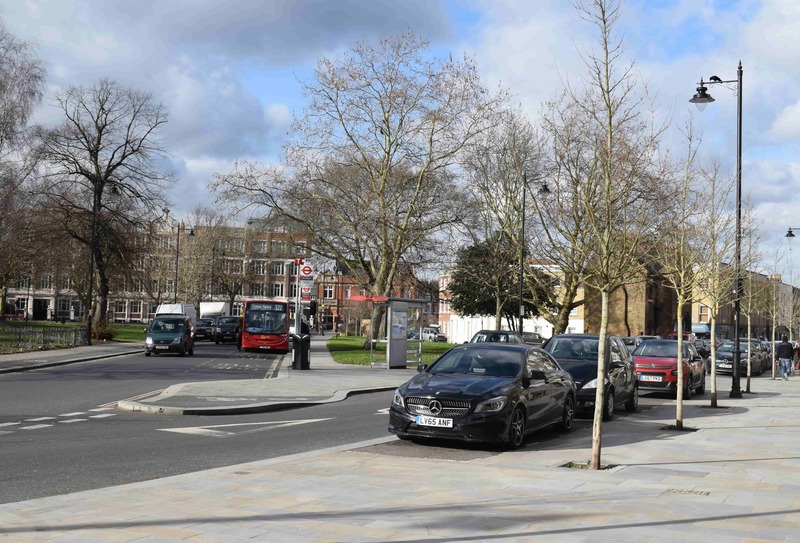 If TfL are willing to redesign Archway, affect a dozen bus routes and cause long tailbacks on the A1, it is difficult to see how they could argue that the Crouch End scheme would be unsupportable because of the affect on the W7. We’ll see. Will this project will make things better in general? 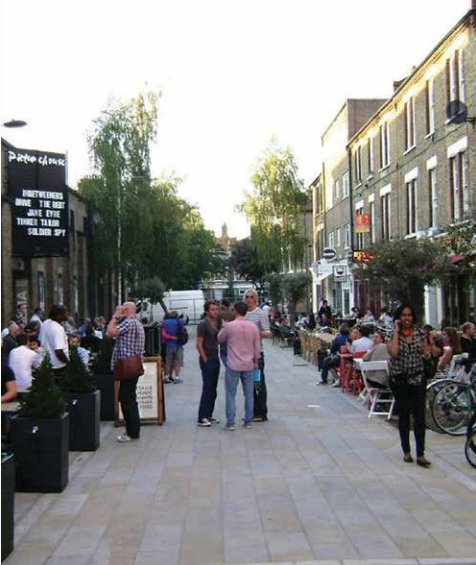 The trade off may be a simple one – swapping 10-15 parking spaces in return for wider pavements, greener spaces and hopefully a more vibrant town centre. If we see a line of shop closures the damage caused is too deep. If we get it right, the economy will flourish and it’ll work. The real gains will be for pedestrians, shoppers and visitors, particularly along the main drags – but we need to be honest about negative impacts in the new arrangements. I doubt the imposition of cycle lanes is quite the panacea some cyclists think it is, and I do think that in any scheme there are likely to be losers. In Part 1, an introduction to the Liveable Neighbourhoods Initiative. As you say, , the reception to your presentation about this scheme at the CENF was cautiously welcoming. The values enshrined in the proposal (tackle pollution, congestion, reliance on the car and get us on our bikes and walking and reap the health benefits) are a good fit with what many people who live in the area would buy into..
As a shopping centre, Crouch End has survived well in comparison to the remorseless decline of many others and has done so by constantly evolving. Despite all the coffee shops, restaurants and estate agents, it has a maintained a good food and retail offering. It has a good section of national chains that provide an anchor function and a substantial number of small sole trader/ family businesses. Although transport links to CE are good, the shops rely on a small but important sliver of trade from car borne traffic. Lose that and some businesses who have tight profit margins will lose a big chunk of their profit. There are plenty of threats out there to keep out shop keepers on their toes: rents keep going up, competition from the internet and home delivery intensifies and we are yet to understand the impact of the large Salisbury’s that has opened on Hornsey High Street. Convincing traders and others that the proposal will actually increase trade will need a lot of evidence and a lot of trust in the traffic engineers. On the last point, that is something that is lacking. Although the bidding document mentioned time and time again that engagement with local people is crucial, we have yet to see much from the Council about the project. 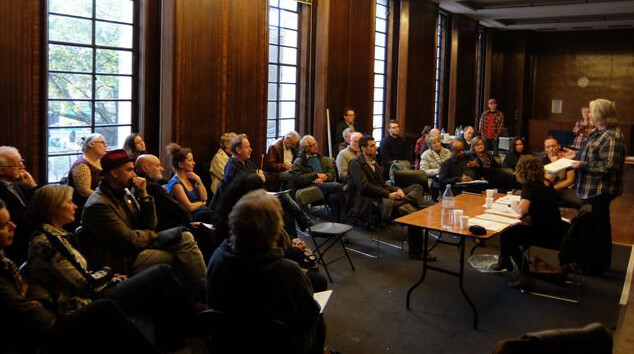 Haringey had a first class opportunity, a platform, an audience and an invitation come to our AGM. Despite plenty of notice, they declined. Whoever become our councilors on Thursday, I hope they will be much more pro-active in getting Haringey to engage with us on what is likely to be the biggest remodeling of the Town Centre for half a century. Interesting and there are many positives, but surely removing the already limited parking would have an adverse affect on local businesses?the car-parking bays in the centre are short-stay only so represent a high foot fall of people running errands, without the availability of spaces people will go elsewhere. As a motorist I find Crouch End frustrating to navigate because there are so many parked cars. Controversial, but i suspect Haringey has sold far too many CPZ permits as a money making enterprise. I use buses daily as part of my commute and Tottenham Lane is a huge headache when parking on both sides of the road is allowed in the evenings and on weekends. It is hard to believe that it’s a major bus route, to be honest. Most of my travails within Crouch End are on foot so I’m in favour of anything that makes pavements easier to negotiate. I particularly welcome the proposal to sort the crossing between Gails and Waitrose. I am mindful of air quality, but am optimistic that a scheme that improves the lot of pedestrians while not reducing air quality is possible, if the will is there. I hope Liveable Neighnourhood comes off and look forward to more detail about what Haringey and tfl have planned and being properly consulted (ha!). 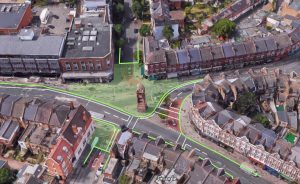 This is really interesting and good to see that Crouch End could become a lot more pleasant for pedestrians or local people as I prefer to call them. In practice losing some parking spaces and making it easier for cyclists will increase the footfall to local shops. There is a lot of national and international evidence that providing improved cycling and people space brings more shoppers into an area rather than less. They will absolutely have to figure out servicing, address possible rat runs, and apply the principles of designing out crime for any new spaces. I agree with Sharon Louth’s comments. It is hard to see how restricting all the bus routes to one road, would do anything except increase congestion and pollution. Tottenham Lane seems too narrow to have raised parking bays. The re-design of Archway has created pedestrian areas that feel too large and dangerous with motorbike crime. Crouch End is already a great area, we don’t need tfl public money to be wasted for questionable improvements, especially when other parts of London have more need. But surely the bus routes are already on one road (The Broadway)? In this plan they’re just dividing a few metres further down. And if Tottenham Lane is too narrow for parking, that won’t change. Meanwhile, other parts of London are already getting public money. TfL and local councils have already thrown infrastructure spending at places like Tottenham, Green Lanes, Wood Green, Walthamstow and Archway. Indeed, huge amounts of Community Infrastructure Levy funds, generated in Crouch End, are already diverted to the East of the borough. We will never get significant spending in Crouch End from Haringey – who plan massive spending projects in Wood Green (again). TfL’s money is the only chance we’ll get. If we don’t take it because we fear spending an extra 2 minutes sitting in the car, we, and the town centre, will be left behind. 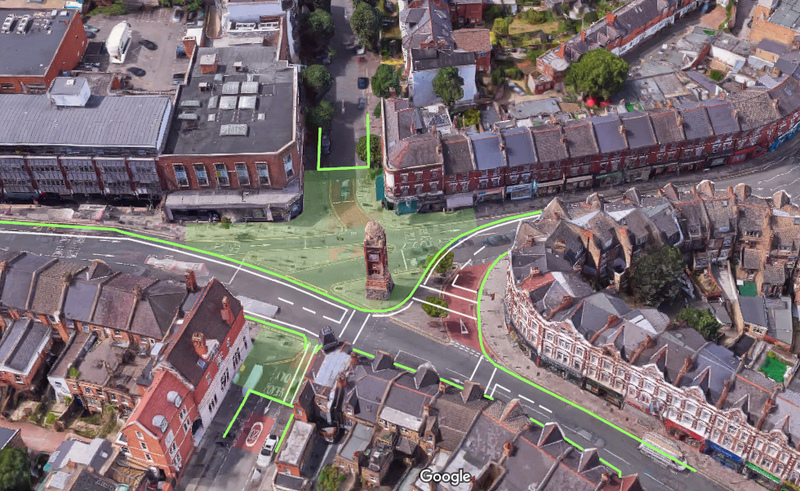 I don’t buy into everything here, but Crouch End can only sustainably prosper by playing to its strengths, improving the town centre by putting people front and centre – not traffic. Surely the pinch point for the buses on Tottenham lane can be remedied by restricting parking (double yellows?) along a small length of road, on one side, ouside the Queens pub? This would fix it, as that’s the only place that it really pinches at. Why respond to this problem by banning parking there? As ever the council seem to want to use an incredibly expensive sledge hammer to crack a nut (and miss the nut). I don’t want it any more difficult to drive. Cars may be bad – but they are essential to our lives at the moment. I don’t like the way so many places are getting harder to drive through with increased jams. IF all public transport was perfect – fine, But it is not – and there are some places that can only be got to in a car ( short time) or PT in four times as long. As someone who has lived in Crouch End since 1978, I feel strongly that any further restrictions on shoppers being able to park will mean the closing down of many shops and local businesses already struggling under difficult trading conditions – in the era of internet mail-order shopping and vast supermarket chains – plus sky-high rents and business rates. I’m a cyclist and local pedestrian, but I’d prefer it if the unrestricted flow of traffic and the preservation of present parking opportunities were to remain in N8. On this basis I oppose the suggestion to narrow or restrict access to Crouch End’s central roads around the the clock tower and the Broadway. The internet seems to be closing down the chains too. And we can’t do much about the rents. Perhaps we need to ask these questions a different way – if the objective is to keep the town centre successful we have to promote sustainable and flexible use. So we have to figure out what the strengths and attributes of the place are, and support those – and it seems to me that having a pedestrian-centred walkable nucleus of shops and cafes is our unique selling point. People do not drive here, load up the boot and take off. They linger. Indeed parking isn’t any kind of local asset – if CE is successful it seems we’ve done that despite having few places to park. And Crouch End’s selling point is certainly not the rate at which the traffic moves through. In fact it’s the opposite. 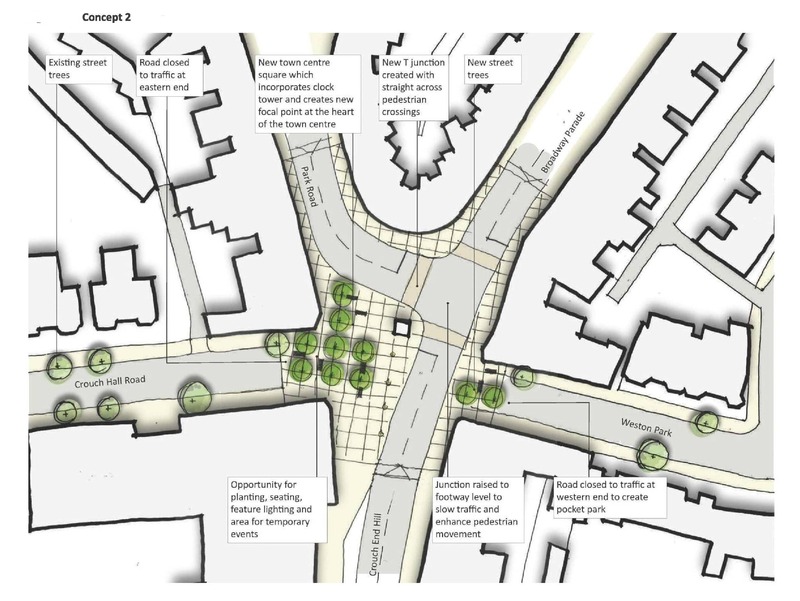 The slower and the calmer the traffic, and the narrower the carriageways, the more the town centre will become a place for walking – and the point of the exercise is to put the pedestrian at the top of the transport hierarchy as opposed to the bottom. The test is footfall – if we play to our strengths, it should increase economic vitality. If there are more people on the streets, maybe the loss of but a handful of parking spots will be more than offset. Love this. Great idea. After the HTH has been developed the idea of a paved/garden zome around the clock tower is awesome. Looks like a decent set of proposals to me. I’d fully support anything that reduces traffic volumes and speeds in the town centre, prioritises cycling and walking, and creates safer spaces for people to linger. The worry of increased congestion and pollution is, I believe, a bit of a red herring. Certainly, London-wide reductions in private car usage shown that restricting road capacity is one of the most effective ways to reduce car use. I also don’t buy the argument that loss of parking will damage local shops. The benefits of a scheme like this can bring in more customers too, but I’m sure the likely impact can be more accurately estimated by surveys and modelling. I’m also sure we can learn from the impacts that similar schemes have had in other parts of London, the UK – and, indeed, the world.